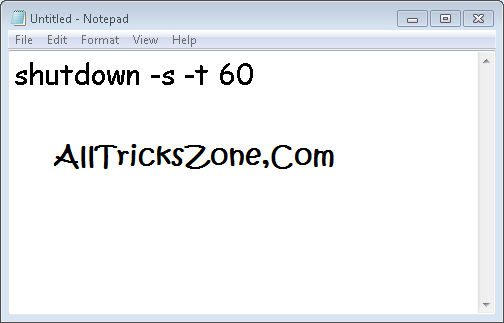 Hey guys, Here is a Easy Guide where, I will explain you How to set a Shutdown timer on windows pc with Notepad. You can easily Set Shutdown Timer in your Windows 7 / Xp / 8 / 8.1 / 10 Pc with the help of Notepad. Windows is one of the best Operating System for PC because of it’s features, and Development. If you are doing some specific work and you Want to Shutdown your Pc Automatically, Just Right after the Selected time, like Countdown timer, So by following below easy step you can easily set Shutdown timer on your PC with Full guide. Also Give it try How to Create Fake Virus for Prank with your Friends. So, if you want to Turn off / Shutdown your Windows PC, at a Specific time, then this easy guide will help you for sure. In Windows PC, by default there is no way to Schedule Shut Down you PC, but I am going to share an easy method, in which you can very easily Shut Down Your PC with one click. So simply checkout now from below. In a Laptop Pc for some reaseons, you may need to shut down your PC, after some time automatically. Then you can simply follow below procedure for this Purpose. With below Command, you can create a Shutdown command, in your PC very easily. If you want to download sometime big file and your internet Connection is Slow, then you can also set timer in your PC, Before sleep and keep your PC downloading files. So your pc will automatically Shutdown in Specific times, and you don’t need to worry about turning off your pc anymore. Someday before, we were shared a Guide about Prank your friends by Crash Their Browser so give it try. Also try – best way to Get PlayStore Paid Apps for free and Add Recycle Bin In Android. First of all, Simply You Need a Windows Pc / Laptop for follow This Guide. You can’t use below procedure on Linux Or Mac OS PC. 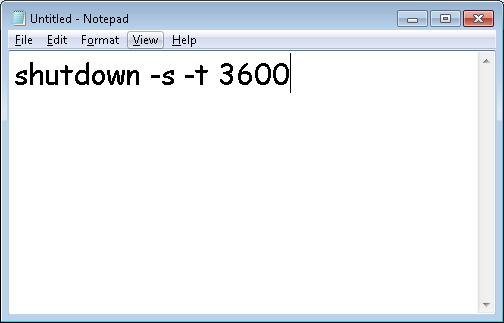 Firstly, Press Windows Key from PC and Search for Notepad and Simply Open Notepad from your Computer PC and type the below simple code. In Above Easy Command, 60 Means 60 Seconds. if you want to Shutdown your PC right after 60 Seconds, then you can simply Enter 60, And if you want to shut down your pc, after 1 Hours then Enter 3600 like this just Enter Time in Seconds, according to your Choice in Above Command. Now After Type Bove Code in Notepad, Press File – Save option and while Saving File, Save that file with Name of All Tricks Zone.bat . You can also Save file with any Other Name, but you must add .bat extension after the filename, Beside of .txt . Then When you Successfully Save Files, Not Simply Copy or Move file to your Desktop. As soon you click on Shortcut, it will Show you an Alert, That your PC will Shutdown Automatically in a Specified time like screenshot. So Friends, This was the easy way for How to Set a Shutdown Timer on Windows, you can follow and every step. For Using this Awesome feature of schedule Shutdown. This Command will work on Windows Operating System Pc only. Also Try :-Device Emulator for Snoof Gmail and Facebook Social Toolkit Download Premium for free. That’s Guys, This was the Very Easiest way for how to set shutdown timer in windows pc. This Full Guide will surely work in your pc. and if you follow above steps correctly. 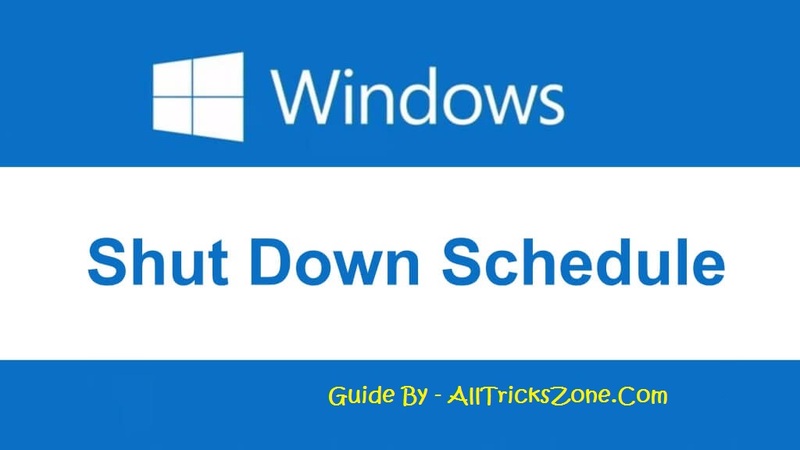 so you can easily Follow above Guide and Schedule Shutdown your Windows Which is Based on PC easily. So, I recommend you to try this guide at least one of the time for Better knowledge in PC field. So some good experiment, for learn Something new. If you have any other !dea, which we should share here in this article or blog then feel free to comment below, i will check that. Also have a look at Solve This Windows is Not Genuine error. or if you have any type of issue while following this above steps then simply comment your valuable comment in below section i will try to answer your Query as soon as possible. come once again for cool tricks like this.